Chelsea kept a clean sheet and created a number of chances in a highly impressive away performance. Manuel Pellegrini was without Sergio Aguero, Samir Nasri and Fernandinho. He kept a 4-4-2 with Edin Dzeko and Alvaro Negredo upfront, and brought Martin Demichelis into the midfield. Jose Mourinho left out Oscar and played a cautious midfield featuring both David Luiz and Nemanja Matic. Chelsea were excellent here, working extremely hard without the ball, counter-attacking effectively and being more adventurous than expected. The formation decisions of both managers were crucial in the pattern of the game. Manuel Pellegrini stuck to the 4-4-2 system he’s played for the majority of the campaign, with two out-and-out strikers. This was a slightly surprising decision considering the nature of the game, and Pellegrini’s injury absences. No-one would have batted an eyelid had Pellegrini played this system with a fit Sergio Aguero upfront, but without the Argentine the selection of Dzeko and Negredo together was questionable. They’ve combined well when starting upfront as a duo previously, particularly in the recent Capital One Cup thrashing of West Ham, but this match was a different situation entirely. City’s problem wasn’t the standard 4-4-2 issue – being outnumbered and therefore overrun in midfield – but more about the relative lack of attacking options when the midfielders had the ball. Dzeko and Negredo were rarely guilty of making the exact same run, but didn’t provide enough variety to really stretch the Chelsea defence. In hindsight, Pellegrini might regret not playing James Milner on the left, moving Silva into the number ten position, and playing only one striker, as he did in the 2-1 win over Liverpool. The 4-4-2 is much flatter without both Fernandinho and Aguero, and seemed more predictable. On paper, Mourinho’s side looked like the defensive-minded 4-3-3 that helped grind out a 0-0 at the Emirates, with Oscar omitted and another holding midfielder in the side. Instead, it was more of a 4-2-3-1, albeit with Ramires playing a very narrow right-sided position (similar to how he’s played with both Benfica and Brazil previously, and probably his best role) and Willian central. Mourinho might have been planning this all along, but it’s also possible he switched to a 4-2-3-1 having realised City were using Demichelis in midfield. It would have been a waste not to put a dangerous attacking player close to him, testing his positioning and tackling skills – and, in the event, the Argentine looked uncomfortable at various points, although was probably better than when played at centre-back. The most remarkable thing about Chelsea’s performance is that they kept a clean sheet, the first at the Etihad for a visiting side for over three years. The key to this was nullifying Silva. City’s side was less creative than usual – Demichelis isn’t as positive in possession as Fernandinho, Dzeko doesn’t have Aguero’s guile in deep positions, and the lack of Samir Nasri robbed City of their second most talented playmaker, too. Therefore, there was a huge emphasis upon Silva. Jesus Navas can cross, and Yaya Toure can storm forward, but Silva’s passes can be impossible to defend against and are more crucial in the type of football Pellegrini demands. Stopping him was no easy task. Silva is averaging close to four ‘key passes’ per game this season, an unparalleled figure. Four separate players all contributed to minimising his space – Luiz was usually closest, Matic acted as cover, while Ramires’ narrowness helped prevent passes into him, and Branislav Ivanovic tucked in naturally to deny space in that pocket, too. It’s difficult to remember Silva attempting a single through-ball, his speciality, although he did get into good goalscoring positions. Silva drifting inside, plus Ramires playing narrow, meant the space was all down that flank. The game’s first chance came when Aleksandar Kolarov stormed forward, received a pass from Toure, and crossed – nearly finding the Ivorian at the far post. Later, perhaps City’s best chance of the second half came when Silva couldn’t turn in another Kolarov cross. Equally, it allowed space for Ivanovic to get forward, and his aggressive positioning was obvious even before he gave Chelsea the lead. 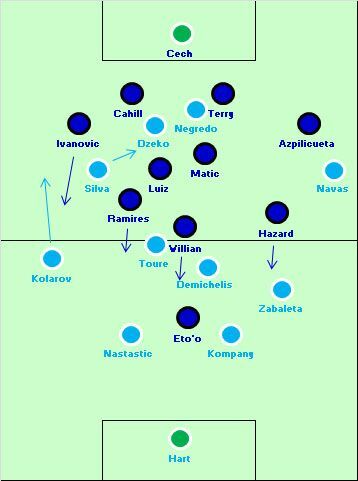 The narrower Silva became, the more Ivanovic could attack – safe in the knowledge Chelsea had two holding midfielders ready to cover. Mourinho wouldn’t have expected Ivanovic to score the opener from open play, but he tends to come up with important goals – as he stuck, Silva was high up the pitch in a centre-right position. Chelsea primarily threatened on the counter-attack, where they had three quick runners behind Samuel Eto’o. The Cameroon striker wasn’t one of Chelsea’s star performers, and arguably the only player on Mourinho’s side that wasn’t genuinely excellent. However, he continually made dangerous runs in behind Manchester City’s centre-backs, who appeared nervous all night, misplacing clearances and getting in the way of one another. The key attacking players broke forward from midfield, though. Chelsea had tremendous pace in three different ways – Ramires’ incredible speed over long distances, Willian’s consistent short, sharp sprints to find space, and Eden Hazard’s ability to shift up through the gears and beat opponents at will. Chelsea’s best counter-attack came at 0-0, from a stray Negredo pass that meant the away side could attack four-on-one, following a City corner. Unsurprisingly, the four runners were Eto’o, Hazard, Willian and Ramires. Eto’o and Hazard had stayed up as Chelsea defended the corner, Willian was protecting the space on the edge of the box and ready to break, while Ramires – the man who found himself with the chance, and eventually produced a poor finish – was actually marking Negredo when the Spaniard misplaced the pass from on the edge of the City box. He sprinted 80 yards to the opposition box in eleven seconds to shoot – the Brazilian’s’ desire underlined Chelsea’s commitment to playing on the break. These players’ energy when defending was also crucial. Willian consistently shut down opposition midfielders, while Hazard battled back to protect Cesar Azpilicueta, who handled Navas well. Pellegrini didn’t change anything for the second half, but turned to Stevan Jovetic just twelve minutes after the interval. This was his only substitution of the match, and was broadly successful – Jovetic played a different role to Negredo, the man he replaced, dropping off the front and drifting towards the left. His contributions were inconsistent – he gave the ball away too much – but he provided a spark previously missing, brought Chelsea’s defenders out of position, and was a threat from long-range. It gave another dimension to City’s play. Mourinho’s changes all came in the final ten minutes, and were about shutting down the game. Oscar replaced Samuel Eto’o, with Hazard going upfront, then John Obi Mikel and Demba Ba were introduced for their height, as Mourinho anticipated an aerial bombardment. As we’ve seen before, Mourinho happily shifts to an extremely defensive system – with a back four plus Matic, Luiz, Mikel and Ramires at full-time. Chelsea defended deep in the closing stages, and Cahill, Terry and Petr Cech did the dirty work when required. This was the perfect away performance: solid defending, a clean sheet and sporadic chances on the counter-attack. 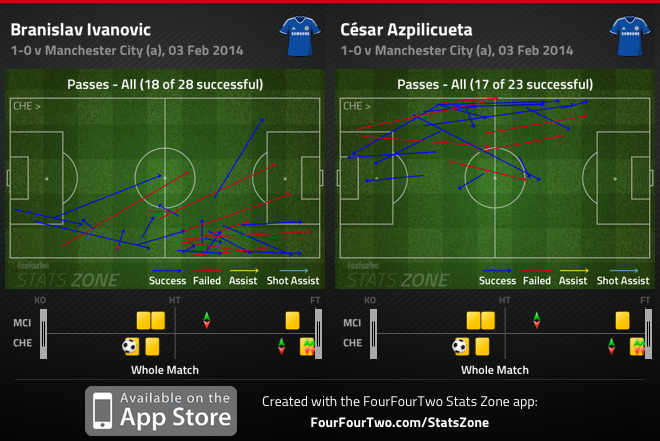 Chelsea hit the woodwork three times at 1-0 up and created some promising situations on breaks. They also defended excellently, with the midfielders working hard and the defenders flawless inside the penalty box. 1-0 is a slender defeat, but there’s not a single area where City were superior in this game. Their defenders looked nervous, their midfield didn’t cover the space effectively without Fernandinho’s energy, Silva struggled to create chances, Navas lost his battle with Azpilicueta and the strikers didn’t offer enough variety with their movement. Clearly, it would be foolish to question City’s overall strategy considering their astonishing results this season, but in the biggest games Pellegrini could, in future, seek to play an extra midfielder rather than two forwards – certainly if Aguero isn’t available. City’s 4-4-2 is definitely workable with Aguero and Fernandinho, but without adequate replacements (at least until Jovetic is trusted from the start) is becomes, in effect, an entirely different and more basic system. Chelsea’s default style – pragmatic, counter-attacking, disciplined – lends itself more to big matches like this, whereas City’s all-out-attack style is more efficient at beating smaller sides. The results so far this season underline the difference – City have collected six more points against other sides, but Chelsea have won both head-to-head clashes. There is the only one who can be credited for the Chelsea win.. Not Mourinho, not Chelsea players..
You cant call Chelsea performance “solid defending”, if the opposition can score 3 golas in the first 10 mins and Yaya Toure is dribbling through you defenders like Messi and creating chances. But it is Mourinho, when he played without a striker on United where low teams go for 3 points, he was celebrated by the press too, because he got the point from Old Trafford, lol. “6 or 7 clear chances” when was this?! watch the match next time? Even Mourinho fanboys at Sky Sports were saying that City should have been winning 3:0 after first 15 mins. i don’t think city even managed 3 shots in the first 15 minutes. you can include the kolarov cross toure narrowly failed to connect with but i can’t see how it could have been 3:0 without chelsea passing it into their own net. of course, you’re probably just exaggerating, but that’s sort of the point isn’t it? but City didn’t score. Chelsea contained them. and by your logic, Chelsea could have put the game to bed as well. they hit the woodward 3 times. AND not to mention that 4 v 2 with Hart blocking the poor finish by Ramires. also, Nastasic should have been sent off with a straight Red with that pull on Oscar. Don’t get why City even signed Demichelis, let alone why they played him in midfield last night. Back in his Villa days, James Milner played through the middle and was excellent – and why City paid all that cash for him. I don’t understand why these days he’s only trusted as a defensive winger. Clearly he wouldn’t start there for City very often but given they were missing a few I would have thought he could do a job better than Dimichelis. Equally, Jack Rodwell is surely a better option in central mid. Both can get forward and defend. And aren’t centre backs. Their limited use does England no favours. i think this one of the stupidest review that you had done . nullifying silva i really dont understand as to how was he nullified . he had the best chances on the field for city . i think a better review was done by the guy in the telegraph who criticized toure for wandering too much on the field . at half time andy townsend and roberto martinez were discussing as to how city could get back in the game . they suggested that one of the two from negredo and dzeko would be removed and milner be bought on the field which would bring more space for silva and toure in the middle . in the back four . so later eto would just drop a little deep and start chelsea counter and the city players would be caught upfield . my point is the space between demechelis and the back four was too much the back four should had moved some what forward . now the other thing is about the final balls from chelsea and city and the position of their midfielders . chelsea always had matic and luiz to protect their back four there was virtually no space between chelsea back four and their two midfielders to explore . many a times matic and luiz made the necessary interceptions . compare that to chelsea counter attacks . city had a back four but never demechelis and toure there to protect the space in front of them and chelsea just used that . the final balls many a times cut backs since there was nobody in front of the back four to protect and city just scrambled to defend and hart was good yesterday . for me the fault with city was they should had somebody in the middle to protect the back four and then city would had been better . dzeko was on the pitch just because he was better in the opening exchanges but negredo is one who can play better as a lone striker than dzeko and is better threat in the air than him . the biggest fear for me is city is having these big games coming up and if they continue to play the way they had played yesterday with that shape than barca will definitely exploit that space in the hole . alexis or fabreagas will keep on dropping deeper and linking with messi who on a run is quite difficult to stop . i think we can conclude now that david luiz is now officially a midfielder and a big game player . jose is using him the same way as benitez used him who in turn copied this idea from former barca coach rijkard who used to play edmilson in front of the back four . I don’t think ZM’s wrong in his assessment. Silva’s main attribute is to thread passes for other players. Yes he was dangerous when a couple of Kolarov’s crosses found him but Silva couldn’t offer another point of attack through the center, which is why he’s allowed to drift inwards. Chelsea were so narrow and determined to deny him space between the lines and Silva didn’t try to find himself space elsewhere. Adding Milner might have been useful if he could stay down the left wing but since he’s right footed he might also have wanted to drift inside and again City would have played right into Chelsea’s hands. Jovetic needs more games and while he was impressive against Tottenham’s fairly leaky defense, it doesn’t mean he can do it against a team that is designed to block the center of the pitch. Jovetic had opportunities and he had space to play balls out wide to Navas. Yaya Toure has always had this issue of jogging even in games where City are dominating. He will always charge forward but he’s a bit questionable when he positions himself and often commits cheap fouls if a player escapes him like Hazard did a few times down the touchline. Dzeko probably stayed on because he’s more of an aerial threat and could outmuscle Cahill and/or Terry. As for Demichelis, he was always likely to be a scapegoat considering how often Ramires and Willian would often cross each other’s paths and with Yaya Toure late they both got a lot of time on the ball especially as Kolarov was also caught forward a few times. are marathi ahe ka tu tar marathi tun uttar deto . pan pahelay purna vach wa game samaj magach . Well, Demichelis is actually a defensive midfielder, he was converted to e centerback when he got older. However i think he would do a better job as a central defender, he is too slow to play as a CM in a team like city. I can’t agree with those who are berating City, who actually adopted a sensible game plan: try to use the full backs to create overlaps, as it was clear that Chelsea were going to pack the centre. This actually worked well in the first 20mins, both from Kolarov’s drilled deliveries on the left, and clever interplay between Zabaleta and Toure on the right creating a v. good chance for Silva. It’s not that City were poor (although clearly Fernandinho especially was missed) but that Chelsea were staggeringly good. The last twenty minutes of the first half in particular were incredible: I’ve not seen such a ruthlessly efficient away display in England for many years. What I think has been missed by all the commentators on the game so far is the amazing ability of Chelsea’s “small” front four (Eto’o, Willian, Ramires, Hazard) to win long balls. On several occasions they outmuscled either Demichelis, Kompany or Nastasic – and however much we laugh at Demichelis, he’s always been solid in the air. It was THIS that allowed them to start counter attacks, at which point everything Michael says applies: City’s midfield were simply incapable of coping with Chelsea’s runners. What is also worth noting is how prepared Mourinho was to play a ‘broken’ team: i.e., to have six sitters and four attackers, and not to be particularly worried if the four where bypassed by City and a huge gap in midfield emerged: he trusted the six to keep their (deep) shape and hold up City’s moves enough for the four attackers to get back into shape. 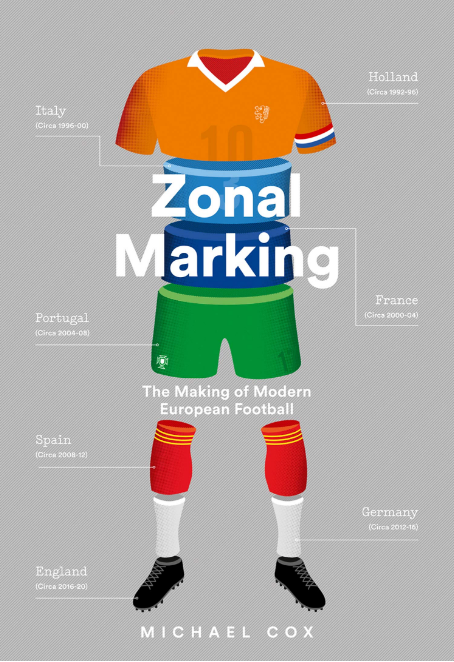 There has been huge emphasis in recent years – especially from Jonathan Wilson – on modern football being about ‘total’ pressing by the whole team. But yesterday showed that if you have a solid six, you can still be successful without this total pressing, which after all has both immediate dangers (counters behind the full-backs – see Barcelona) and long-term ones (burnout – see Dortmund). It was nice to see Wilson acknowledge this in the Guardian this morning; although he has done more to revolutionise football writing than any other journalist, his tendency to find Bielsa at the origins of all modern tactics was threatening to turn into an obsession. Like it or not, Mourinho’s tactics are both ‘modern’ and incredibly successful; moreover – an argument could be made – they are more reliable in the long-term than any Bielsa-driven approach could be. Yes good point on broken team. Mourinho did that a lot v Barca too – the front four pressed and then the back six remained in possession. It’s interesting and very different to the approach of most others. ” the back six remained in possession”: position? It wasn’t perhaps “total pressing”, but I was surprised how much Hazard and Willian pressed on the 2nd half and how many times they actually won the ball from the City midfield. Many of the counter attacks were not started from deep in Chelsea area with City drawn to attack, but way more Barca-like. Perhaps City were not expecting the kind of aggressive pressing, but it seemed quite strange how their midfield lost the ball so often in such bad places. You are also exaggerating my friend. This is how you play a counter-attacking football. Put runners upfront, defend deep with few players. Take the ball, pass it quick forward. You do not have your whole team running forward out of position, because the counter-attacking is quick and not fluid at all. I remember when I was a teenager and training in the local team, our coach will teach us exactly that, which I find very basic. He was explaining who are the runners and what positions we should take and how much we should press, how the defenders will run forward to get the defensive line higher after we take the ball and how are they expected to drop back slowly. My role as a forward was to stay on the left side so I can stretch a central defender and the other forward was staying on the right to do the same and we were expected to run into mid channels after a long ball was given trough the mid. Another thing we were tough as a lonely striker is to get back ask for the ball from the playmaker in order to drag the central defenders, and run past them while the playmaker was giving me a long ball to catch (what Eto was doing in this game). So these are the basics of the counter attacking football, and Chelsea played it very smart and well, but nothing innovative. I think his point was that Chelsea played without true central midfielders, that is without players who keep possession and spread passes around the pitch. But rather, they played with six defenders and four attackers. However, I don’t agree with his opinion about that. I believe that Chelsea’s trio (Ramires, Willian and Hazard) performed both attacking and defensive duties (as should central midfielders do) excellently, but in a defensive counter attacking playing style. city had just 3 shots on target. real shame city weren’t a full strength, chelsea tamed the attacking bull that is man city . despite city’s missing players, still great achievement for Mou, as city players had a built of feeling of invincibility at home. they never seemed to get into rhythm. even from half time, i felt city might have trouble scoring . the likes of dzeko, navas, demichelis can be weaknesses. citys much heralded amazing squad as i’ve said often on here, is nowhere near as strong as the media think. esp when boyata gets on the bench. chelsea’s bench looked seriously strong. city squad strength is really team strength built around several huge key players ..hart, kompany, yaya, silva, aguero (possib negredo) down the spine. pellegrini has done amazing man management to get some of the more wayward players like navas, nasri, kolarov, dzeko who can be great but can go missing, to give their maximum over the season as a whole. i said in the return fixture that this man city side has few goals from midfield in it. that was true looking at players prev stats..but looked utterly ridiculous seeing the goalscoring run this team has produced. much credit to MP for that. don’t quite fully understand how they are doing it – has the new mgr article on MP been done yet ? navas has NEVER scored more than 5 lge goals ever. toure only tends to get 5 or 6 . he’s already broke double figures ( lge goals). ditto Nasri & silva. for once that theory looked to be true. tie-up their strikers and chances are the m/f don’t look like scoring. It is easy to criticize Demichelis, but please don’t forget that he wasn’t getting help from neither Silva nor Toure. City’s biggest problem was maradonesque approach of “5 in defense, 5 in attack”, the responsibility is on coach. I think this game shows that Fernandinho is the most irreplaceable player in the premier league this season. Normally Fernandinho would be responsible for screening the back 4, pressuring the attacking mid, and distributing to Toure, Silva, or Navas in space so they can each do their unique thing. Without him Silva had to provide the creative spark but received the ball at less advantageous times. Toure never got the ball when he could make a run before he could be closed down. Navas was largely marked out by Hazard. Toure was left in a no mans land half way between wanting to attack but having to help DeMichaelis in defensive duties. All of this allowed Ramires amazing freedom to operate on the break. Fernandinho has the athleticism, speed, and smarts to break up a counterattack and still be able to recover to help the back 4 if he forces the attack to the wings. I agree that what pelligrini really needed was to replace a striker with another midfielder to either distribute better or pressurize the counter early to win the ball back. Still City was able to have a lot of shots from inside the box even though most were not on target. I’m not sure if that is a big deal considering that I think Chelsea’s center backs may be genius at positioning themselves to minimize shooting lanes. Yes, Chelsea were brilliant at times and Mourinho got most of the things right definitely, but still I was not that much impressed with him as disappointed with Pellegrini. It was pretty clear it wasn’t working out for City and why, yet he didn’t even try something to get Chelsea outside their comfort zone. Read Matic’s rave about Mourinho’s preparation in the Guardian this morning, it verifies what was easy enough to see: they knew exactly what to do when, cogs in a machine. When I read the selections and saw Demichelis in there I’d hoped for something more interesting than their usual lopsided 442, LOM tucks in, LCB overlaps and so on, maybe a back three or even something hybrid. But no, just a slot in. City may have the best starting XI, I’ve read that countless times in the build up to this game, but they sure don’t have the best cohesion, synergies, let alone flexibility in terms of tactical frameworks. 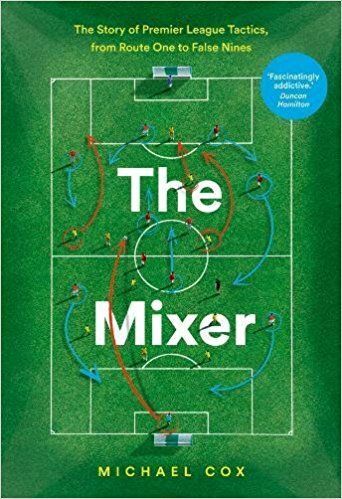 There’s a resurgence of the 442 at clubs with – how do I put this… – not the cheap kind of players, but it merits seem to be more in allowing those players to express themselves than in being a genuine tactical answer. Maybe the inherent ‘blurriness’ or roles and functions, that comes with 442, is a bit of a blessing in disguise there. At least most of the times, it seems you can’t afford much of a drop in individual quality with a system designed to focus on individual quality. Duh, stunner. Again, pretty obvious I’d say and that’s why I expected some kind of tactical answer from Pellegrini that went beyond fiddling around with his strike force a bit when clearly they lost the battle somewhere else. So, a clear victory for the special one with tactics, that in the end weren’t all that special, but ruthless and damn well executed. Still only 3 points, but this feels like a shift of momentum and City’s man at the helm suddenly looks less enigmatic and a lot more subdued. Even with Fernandinho , City would have been overrun. They need another central midfielder in Schweinsteiger mould, and Toure should be pushed forward at the expense of a striker. My opinion is that once Chelsea scores a goal, don’t expect to equalize because that’s one of the hardest thing in the world. Mourinho’s men know how to park the bus very well, they do it better than anyone else. That’s why he once said that winning 1-0 is one of the easiest things in football. And yes, they did park the bus after 1-0, contrary to what some people say because the chances after that were all from counter attacks.